Norwegian Cruise Line and MSG Entertainment announced today that the Rockettes, one of New York’s most illustrious and beloved icons, will christen Norwegian Breakaway as the official Godmothers, further strengthening the ship’s strong ties to New York. The christening ceremony will take place in New York City on May 8, 2013 on board Norwegian Breakaway, the largest ship to homeport year-round in New York. The partnership with the Rockettes will include Norwegian Cruise Line as the designated “Official Cruise Line” of the Rockettes and Radio City Music Hall, and as the “Official Partner” of the Radio City Christmas Spectacular. 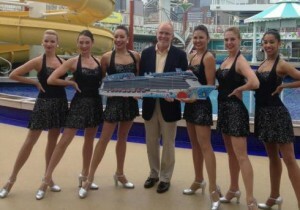 As part of their role as Godmothers, two Rockettes will sail aboard the first six sailings of Norwegian Breakaway, beginning May 12, 2013, and the first sailing of each month thereafter, taking part in special events for guests to enjoy.